Extractive industries face many challenges in today’s economic climate. Getting the best value for money from any product, whether that is the smallest nut or the biggest earth mover, has to be a priority for any business operating in the oil, gas or mining sectors. We provide a worldwide service that ensures that our customer gets value for money. We do this by ensuring you receive the correct product, built to the correct specification and on budget. We are a reliable, honest, diligent, conscientious and above all; efficient. With extensive contacts throughout the world we are able to source every item of material or equipment your company may need and fulfil any requirement. Africa is becoming a powerhouse in the worldwide economy and the extractive industries are the driving force behind many African country’s economies. Many African governments regulate the industries to encourage fair play and ensure that their country’s natural resources are used to the benefit of their nation. Understandably, procurement has become a target for regulation and this does pose significant problems for multinational companies doing business within those countries. We understand those regulations and safeguards that governments put in place and help purchasers from within such countries import material and equipment legally and efficiently. Oil and Gas are some of the most important resources any developing nation needs to extract, the wealth of a country can be significantly influenced by oil and gas extraction. We provide a procurement service that we believe is second to none and count many multinational oil and gas companies as our clients. The whole process is catered for, from exploration and extraction through to refining and delivery. New and used drilling rigs, pipelines, complete refineries and all attendant materials and machinery can be sourced, procured and shipped to your port of choice or to its final destination. 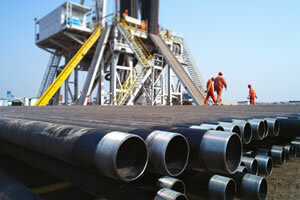 See our Oil & Gas Equipment page for more details.